3003 aluminum is a non-heat treatable alloy used primarily for sheet metal work, duct work, and chemical equipment, as well as in the manufacture of a wide variety of aluminum parts: gas lines and tanks, refrigerator panels, heat exchangers, and garage doors. 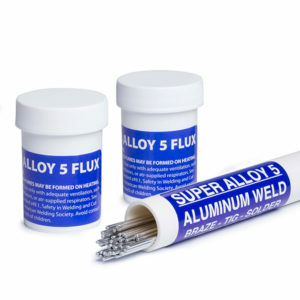 Super Alloy 5 is used to braze the aluminum with weld strength. It is important to use a torch designed to adequately maintain even heat while welding aluminum, as aluminum dissipates heat very quickly. If Super Alloy 5 balls up at the end, this is an indication that the parent metal is not reaching the proper working temperature. To ensure a successful weld, be sure to follow the steps outlined in the video, and broadly heat the base metal rather than the filler rod. Super Alloy 5 flux works as an exact temperature guide, liquefying at 600°F and pre-cleaning the base metal. Simply watch the flux, and apply the rod as shown.